It is a truism that the law changes, but so too is the fact that lawyers have changed along with it. Until well into the post-World War II era, legal fees were based not only on time spent, but also the nature of the service, the result achieved and the amount at stake. Charging an appropriate legal fee was a matter of professional judgment for these "strategic lawyers." The strategic lawyer is the counselor, the type of generalist practitioner who used to be the standard of the legal profession. Today, of course, many lawyers have often esoteric specialties, some right out of law school. 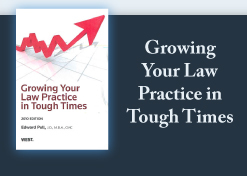 Do lawyers need to focus on limited areas of practice to enhance our competencies and our credibility with clients? There is tremendous learning required to be competent in any given area of practice. Can one lawyer maintain his/her competence in many areas at the same time? Can one truly be a general practitioner in today's world, or must a firm be a group of specialists? • Why do I want them - what challenges do they have that I find most satisfying? • What is my value to them - the reason why they pick up the phone and call me rather than another lawyer? To answer this last question, it ultimately is necessary to ask your clients why they hired you. The specific reasons they give will tell you what business you are in. In other words, the lawyer most in demand is one that provides services clients need. If your skills are no longer in hot demand, modify your practice area to adapt your skills to the needs of the clients. If you're in the larger firms, and are practicing real estate law currently, you might be better advised to learn bankruptcy or workouts to adapt your current skills to the needs of the clients. If you're in a small firm or sole practice, this might be more difficult to accomplish with less personal economic impact, but still possible. The point is, just as the best way to catch a fish is to go where the fish are, the best way to get a client is to offer the kind of services clients want. An ounce of prevention is worth more than a pound of cure. A recent white paper suggests that law departments can be more than an expense to their companies, they can be profit centers. They can do this by recovering money from vendors who breach their warranties, who are at fault in product liabilities cases and similar modalities. It's easy to measure ROI in those circumstances. It's more difficult to measure ROI when you prevent harm from resulting by good lawyering in the first place. See my blog post for further thoughts on this. Sole and small firm lawyers, in particular, need to be more proactive in providing preventive actions for their clients. The cure will always be viewed as an expense. However, prevention can truly show your value to your clients and they will pay more for perceived value than they will for perceived expense.